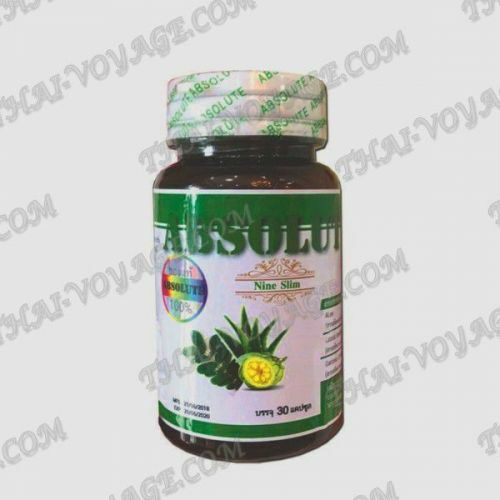 Thai herbal capsules for weight loss and appetite suppression Absolute Nine Slim has a completely 100% natural herbal composition and aims to bind, remove fats and improve carbohydrate metabolism. The use of capsules in the body activates the mechanism of signal transmission to increased fat burning, normalizes the work of the brain center of appetite and saturation, increases energy production by burning fat and stimulates the function of cleansing systems – the liver, bile ducts, intestines, kidneys. As a result, there is an effective weight loss with simultaneous General improvement of the body and increased physical and mental activity. In this case, the capsules contribute to the excretion of toxins and metabolic products, reducing the risk of diseases associated with overweight. Capsules significantly contribute to the reduction of appetite (energy of the body switches from digesting food to burn excess fat), reduce cravings for sweets and starchy foods, to get rid of the habit of seizing the stress. Due to the action of 100% natural ingredients, capsules Absolute Slim Nine, accelerate the process of fat decomposition, due to which occurs the reduction of the volume of the thighs, abdomen and waist. Accelerate fat burning processes, favorably stimulate the digestive system, have a diuretic effect, reduce swelling. With the first use of Absolute Nine Slim capsules, it can be noted a significant decrease in appetite. At the same time, due to the content of natural 100% vegetable composition, capsules Absolute Nine Slim do not cause side effects. - wants to help the digestive system and intestines detoxify. The drug effectively removes toxins and slags from the body, improves digestion and metabolism. There is an effective weight loss. As a result, the effect of taking herbal capsules Absolute Nine Slim is preserved for a long time. Application: 1 capsule a day in the morning before meals or during meals. Take the drug is recommended to achieve the desired effect.